It all began with the annual family reunion. We would all compete with each other for the title of best barbeque sauce. Everyone had their own "secret" recipes, but naturally mine was the best! As time passed, family members and friends started wanting me to make barbeque sauce for all of their occasions. I never gave it much thought until the Christmas of 2002 when I had a brainstorm. You see I usually try to find a simple and unique gift for all of my family members that would be special to them. I was resting in my recliner one evening thinking, "What in the world could I make for my family this year that would be simple?" Then it instantly came to me...Barbeque sauce! I jumped up and ran to tell my husband my idea. The next thought was where in the world are we going to get "all of the things we need to bottle it with? That was a real dilemma! I began searching the Internet and found sites to order my supplies. I made my first labels at home on my computer. Now I had all of my bottling supplies. I just needed my first batch of sauce. I was off to the kitchen to start cooking. After that first batch things just snowballed. Family and friends ate the entire first batch within the first week. Within a month's time, the community knew about the sauce and we were receiving more requests than we could fill. They wanted to purchase the sauce by the case! SO that is where we are now. 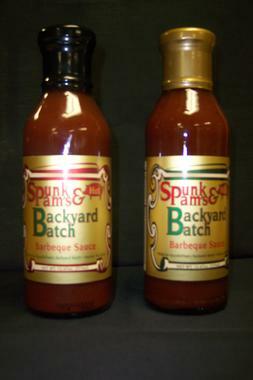 We are selling the sauce and excited that you are purchasing it as well. We hope that you enjoy it and try our other sauces. We love making it and this is a dream come true. Hopefully this story will inspire others not to give up on your dreams and to persevere because dreams can become realities.